As I promised yesterday, here are a few more things that I have been working on this week. I bought this and couldn't decide how to paint it, so I stenciled it. Little signs to sit or hang. 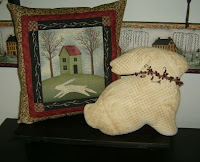 Table bench, pillow and quilted bunny. Prim angel made in black homespun with quilt wings. Prim Santa perfect size for a wreath. When I first crawed out of bed this morning, it was a little drippy and droopy outside. But, as the morning has progressed...the sun came out and I thought to myself, this might be an okay day. As lunch time approached it was pouring down rain and the wind was blowing. It was like this most of the day, until dinner time. The rain has finally stopped, but it seems cold to me in the house. Hubby has been on vacation (again) today. I had a few things planned for him to do, but they didn't pan out, so maybe next time. I got early as I usually do and looked around at a few blogs. I think I have finally figured out how to blog everyday. Just get up 2 hours early and you'll have plenty of time to read and post. LOL!! They don't have a home yet, cause I just found them yesterday. But, as soon as I find a spot, I'll let ya know. EASTER is on the way!!! 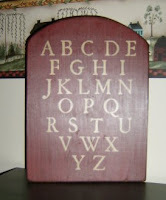 Now I've learned my ABC's! I can't believe that it has been almost a week since I have posted here! As many of you have noticed, I did make some changes on my web site and at the moment, I don't have as much to choose from as I have had in the past. But, if there is something that you might have wanted....just let me know and I will try to take care of it for you. I have had several folks e-mail me that something was gone, but we managed to fiure it out and they placed their orders. And this is another one of my packed away treasures from sometime in the 80's....just couldn't seem to throw them out. But, they turned out like this! They're hanging on my front porch fence. This is another project that I have been working on in my living room. I found all these samplers at a store in Winston Salem and bought one of each of what they had. I have a few more, but I think this was enough for the this area. I just love them and I didn't have anything like these in the room. They're pretty grungy and all are in black frames. The pineapple saying is my favorite. Well, it's already after 8:00 and I still have rag balls to grunge, as well as some cheesecloth. There's a few wood items that need to be sanded and antiqued before I go to bed. Tomorrow is going to be another busy day in the neighborhood! Don't ya just love it??? It has been a cold, rainy and miserable day in K-ville today. The kind of day that would have perfect to curl up with a cup of tea, your favorite blankie with a kitty on your lap and read a good book. Those fabulous Spring like days with the 60's and 70's temperatures have disappeared. Winter time has returned! Well, the days are flying by and now we have 10 days until we can move into the booth at the Market Place. There's been a few times that I have almost had a melt down! But, Retha assures me that she has tons of GOODIES to fill up the space, so I am relaxing a little more today. I am just so thankful that they didn't wait until the last day to call us. Then I would have been in a TIZZY! LOL!! We have had at least a little time to get our thoughts and plans together. The discount sale ends tomorrow on the 19th. Details are on the front page of my site. These were found in the garage a couple of weeks ago and I have done a "re-do" on 'em this week. I think they turned out pretty cool. The candlesticks are a hod podge collection that I just spray painted black & added grungy tapers. Not sure where they will end up though. The jar is one that Mom had saved for me. It was originally filled with bean salad with a screw on lid. The lid shown was one that was zinc colored, but it didn't work for me. So, I very carefully spray painted it as well. Much better for my taste. I think this will end up on my counter....I kinda like it filled with the little rag balls. There are still "to do" or "re-do" projects in the garage, but I am really pleased with the progress that I have made. There are still several things that I would like to finish this week, but I'm doubtful that is going to happen. Almost enough room to get the 2ND car in! Woo Hoo!! Wanted y'all to see this stitchery that Cait has made for me. She did a really nice job and I love the way it turned out. She has a great stitching technique and it looks fabulous. We hope to get this added soon to my web site...look for it in the near future! That's all for this Wednesday evening. A Few Plans For The Rest Of The Week: oh my, so much to do, so little time...work on the web site, work on orders, make some goodies for the new craft booth, look for display pieces, finish organizing the garage and the list goes on and on. Do ya think it will all get done???? Here is picture thought I am sharing...this is another one of my re-do pieces. It's been a little more like Winter weather here...chilly, chilly, chilly. And we may get a snowy mix tonight. What happened to the 70 degree temps???? First, is a heart table that my Dad made and shipped to me when I first moved to Detroit in 1982. I had a teeney, tiny foyer and wanted something there to hold keys and such. This what he came up with. It has been packed away for quite a while, but I couldn't ever seem to get rid of it. Found it and decided to paint it....fits perfect in the corner of my breakfast nook. Forgot to take before pics of the box... Old, old brown recipe box that I have had for years and decided to repaint... looking for a spot to put it on my kitchen counter. ****Afterthought****A note to Shari M. of Derry, PA, I tried to figure out a way to email you but I just couldn't figure it out. I wasn't named for the famous Shari. My given name is Sharon, but everyone calls me Shari except for my family. Thanks for signing my guestbook! After 35 years of Valentine celebrations, my wonderful husband still can make my heart skip a beat! We have such a fabulous relationship and my wish for y'all is that you can have something as special as what we have, even after all these years. We started out with breakfast together ( we always do this on weekends, but it was exceptionally nice, cause it was a special day) and we basically had a snack around lunch time. I got my gift before dinner and I was thrilled! He got me the earrings to go with the necklace that he got me from Christmas. (Do y'all remember it was one of those WOW gifts???) So special and I love them!! Jane Seymore designed them for Kay Jewelers and they are so perfect for me! Then, on to dinner with shrimp cocktail, steaks with all the fixins and dessert! What a fabulous meal. We thoroughly enjoyed it. I had too much to eat, but after all it was a special occasion! I'll diet tomorrow! Maybe. I had planned to show y'all more pictures today, but I am so tired that I am going to close with a picture of my Valentine Tree. I'll be back soon with more pics. Ya know it didn't even occur to me that it was Friday the 13th until just a little while ago. I guess I'm not too superstitious....and today WAS too busy to even think about it. The kids came over and we had such a nice visit! Alex and Miss Elle haven't been over in a while since they are going to school 3 -4 days a week. They love it and Fridays are the only day they are both home. Lately, they have had play dates or something else going on. This is Am, Miss Elle and Alexander! Don't they all look so much alike???? No one could mistaken who their Mother is. LOL!! Today, me, Amity and Cait started going thru more packed up "STUFF" to see if any of us wanted any of it. Bill and Rufie watched the little ones while we cleaned. Poor Am left with her van crammed packed full. One thing that we did find that was a huge hit was Cait's OLD Playschool Doll House and all the little piecey parts. We had the car, pets and lots of family members. Miss Elle loves it already. I am wondering~ what am I going to do with all this extra space? This is the last of yesterday's purchases and Shari's Friday Favorite for this week. I'm not sure where it is going to live yet, but I LOVE, LOVE, LOVE it. It looks pretty good on the front porch with the newly painted milk can, but I almost hate to leave it out there. Maybe, it will be one of those floating around treasures....you know the kind that are here for awhile and then there for awhile. That's all for today...didn't mean to ramble on so. After being on a WAITING list for a booth at a LOCAL Antique Market Place, Deb, Retha and I are getting a space on March 1st. YIPEE! A big, wonderful, close location for all three of us. Did I mention CLOSE??? No more, than say a 15 minute drive. We could actually go there everyday and take our wares. How exciting! This is what I have personally been wanting for a very long, long time. We all have such wonderful ideas to make this little venture successful! Part of the plan (so far) is wanting to push the fact that our goodies are mostly handmade by us, right here in NC! ( This is a fabulous selling point!) I can't wait to get started! Keep your fingers crossed for us! The Market Place is one of the nicest and largest Malls ( over 45,000 sq. feet with over 150 vendors) that I have ever been in. Today, was my first visit there and I immediately fell in love with the place and found lots of treasures! And as I normally do, I had to bring a few things home with me. One thing is an old, little dough board that is absolutely precious. I've never seen one this small and I'm not sure where it will go, but I LOVED it. Another thing that I found was the little red (cardinal) bird, so grungy and prim, I just loved him too!! And lastly another little wood bowl to add to my collection. Something else came home with me, but I'll save it for tomorrow. I kept telling Retha and Deb about all kinds of things that I loved, but needless to say they wouldn't buy me anything!! LOL!! I must say that it has been a very busy day for me. Working on orders this morning, going out for supplies before lunch and then the call from Retha about the Booth space and spending part of the afternoon there. Then later on, to the post office and out to eat....I am pooped!! I had planned to watch TV tonight, but not sure if I'm even going to do that. Hubby will be home tomorrow, the kids and grandkids are coming by and Friday is sure to be just as busy!! Don't you just love it??? This whole week I have been spending a little time on projects from the garage. Hopefully, in a few more days, I will have everything dealt with. This morning, I decided that If I don't love it.....it's outta here!! No more packing up and shifting to another room. I have done this time and time again, but NO More! One day (maybe in the near future) I will be able to say that I LOVE everything in my house!! I have a ways to go before I can say that, but IT IS a nice thought! This is one of my projects for the week that I found over the weekend, packed away and forgotten about. Just finished it up and Love, love, love how it turned it out! (he he) I will be keeping this one for myself! I think he likes living on my little black table for now. I missed it last week when everyone was posting about their blog space. I meant to do it, just never got around to it. So....here it is! this is my SPACE! I share it with no one! A little corner in my Living Room, with a yard sale desk that took me a year to paint and a screen that has been in my garage since Aug. ( Imagine that!) I'm not sure that I am keeping the 4 panel screen here or moving it to another spot. It's really a neat piece, but it takes up a little more than I thought it would! LOL!! After much careful thought and consideration, I have decided to make some major changes to my web site. There are way too many handmade products for me to keep up with by myself and trying to find someone to help, isn't the answer for me. No one can duplicate what I put into each and every item I make. I take a lot of pride in what I do and am proud to say that most of my items are Handmade by me. I enjoy what I do and it shows with the quality and workmanship that go into all my creations. But lately, due to the sucess of my site, it has gotten to be a little overwhelming for me. Sometimes, I find myself working 7 days a week and it's too much. Please don't misunderstand....I am so blessed to have such wonderful customers, especially in these trying times and I thank God for them everyday. I have worked so hard to build up my internet business and hope that I am not making a huge mistake. Please note: it will be a minimum of 2 weeks to ship as everything is made to order, unless otherwise specified. You might just find something you have to have!! Can y'all believe that it was over 70 degrees at my house today? We spent another day trying to catch up on some very neglected cleaning and organizing. We are actually almost finished! Another car will be able to fit in the garage soon. YIPEE! And I want to send out a very special Thank you to everyone that has kept me in their thoughts and prayers! I can't tell you how much I appreciate it! It really does make a difference. We had an almost perfect day in K-ville today! It was bright, sunny and warm, not a typical February day at all. Short sleeves and flip flops were acceptable! This is the kind of day where you couldn't stay in the house if you tried. I cleaned out some junk in the garage while Hubby washed and cleaned up all the cars. It is so amazing to me the treasures that I have saved over the years and kept packed away in boxes. There were things packed up out there that I don't even remember where they came from. Just know that I couldn't ever seem to part with them. I found lots of frames that I can use for stitcheries along with some rusty springs, candleholders, wood boxes and trays. It was actually kind of exciting....I have moved this stuff from all over, thinking that I might need it sometime. Well, maybe now is the time to use it or lose it. 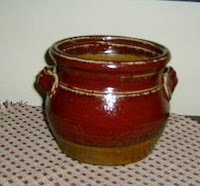 This is one of the things I found today...another piece that my Dad found somewhere along the way, junkin' or maybe a yard sale... It needs to be cleaned up with lemon oil or something. But it's in really good shape. And I have somewhere to put it. Yipee! And look what was inside......lots of old cigarette lighters and a tray thingy from Japan. What an interesting combination! 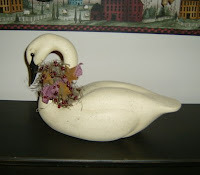 And then in another box, I found this resin swan that I have had for probably 10 years and never finished..........until now. I may actually do this tonight. I have worked on orders all day in between my cleaning and I have the perfect little spot for him. Usually on Friday's, I try to post some of my favorite things. Well, maybe tomorrow. Today, as the story goes, I am telling you about a road trip. What a day! I got the bright idea that I wanted to go to VA to take goodies to a craft booth that I have at Just Plain Country Store in Stuart. I mentioned this to my friend Retha and she wanted to go along. So, she gets up bright and early, and off we go at around 11:00 this morning. On several different occasions, I have made this trip with whoever happens to want to come along. But on this particular day, I guess I didn't remember how far it was. Retha thought it was an hour from my house. NOT!!! It really wasn't a bad trip, a really nice day, in fact. No rain or snow, thank goodness. But, one of the curviest roads that you could ever drive on. I always seem to forget that until I am on the way. I actually thought I might get car sick on the way home this afternoon and I was driving. LOL!! We were gone for what seemed like most of the day. I was starving when we left the craft mall so we stopped to have lunch at a little Diner. I couldn't tell you the name, but it was pretty good. Very friendly folks working there with very basic surroundings and they still had up their Christmas decorations, but nice enough. We both had a barbeque sandwich and onion rings. The desserts looked great, but we didn't try any. I was so tired when we got home that I couldn't keep my eyes open. So, I took a little cat nap before Bill came in from work. As I was resting my eyes, I realized all in all it was a fun day! Retha and I always manage to have a good time when we go out and today was no exception. If you're ever in the Stuart, VA area, it is worth your time to go Just Plain Country. It's full of Antiques, Collectibles, Primitives and some plain ole junk. I can always find something there that I have to bring home with me! And of course, I found a few things today. I think the bucket thingy was used for Coal. It will probably be painted black and maybe filled with sticks or something. I'm planning to drill a hole in the bowl and hang it on my (kitchen) backsplash. The candleholder is pretty cool 'cause it can hang on the back of a chair or on a ledge ( like on the top of a cabinet). That's all for now. But, I'll be back soon. As some of you know we got a little bit of snow here in K-ville on Monday night. This is right outside my front door. What some of you don't know is how it affects us. Businesses and schools are closed or have delays in opening. On this particular winter day, it's 12:30 and it's theres not much evidence that it was ever here. One day last week, I received the cutest and funniest email from a friend in upstate NY. The story starts out that the person loves the cold weather and the beautiful snowfall. By the end of the story, they hate EVERYTHING associated with the cold and snow, but especially the snow plow driver! They sell their house and car and move to Florida! This reminds me of a time several years back when we moved from NC to Farmington Hills, MI. (We were so young and naive. ) We just kinda get teased with the snow around here. And back then we were excited about the differences that we were about to encounter. You know we seldom get enough snow here to really play in or build a snowman. We were the wide eyed children thinking this is so GREAT!!! We had a very eye opening experience the first few times it snowed there. We loved going out to the metro parks and sledding, or just playing in the snow. The roads were always cleared right away and school was hardly ever cancelled. It was beautiful and such a novelty to us. Folks couldn't believe that we left the beautiful weather in NC to brave the famous Michigan Winters. But, we did and I loved the snow in the beginning. I'll never forget one day in early Winter, a city maintence truck came by and put these little red flags all over the fire hydrants in the neighborhood. I couldn't imagine what that for. Maybe they were going to do maintence or something. Not too many weeks later I found out. Much to my surprise....the flags were to find the fire hydrants!!!! There was sooooooooooooooo much snow. Not so much fun by this time. There is snow and snow and more snow. By the time the first day of Spring arrives, (months later) our apartment building parking lot has dirty snow piled 2 or 3 stories tall, and it really wasn't much FUN anymore. Believe me, by then I was almost ready to head back home to NC!!! One good thing, this was the time and place where I learned to sew and craft! I guess all things happen for a reason. I had my first (scroll) saw on the patio of that apartment. I used to cut wood on pretty days! (How funny to think of that now) I'm sure my neighbors loved me. LOL! We lived in MI for a while longer and then moved on to Illinois and I really learned about craft shows, home parties and more! A beautiful day here in K-ville! Sunny and close to 60 degrees. Is Spring around the corner? Or wishful thinking? Well, many days have passed since I have been here to post. What a week we have had! I finally got my blood work back and after a year of trying almost everything.....my numbers are finally up!!! Yipee!! I am finally on the road to recovery! But, we have also had some kind of bug going on here. Hubby is finally almost well after having issues for 2 weeks. Just couldn't seem to get rid of the darn thing. I'm still watching his diet and we're still waiting for some test results from earlier in the week. No news is good news, right??? Cait is still applying for jobs, but has a receptionist job for a few hours a week. Not her dream job, but it helps. She is also waiting to hear about another postion that she went to Raleigh last week and interviewed for. We just keep our fingers crossed for her. Trying to decide what to have for dinner, so until next time. Debra D. of Akron, Ohio was the winner of my monthly web site contest for January! This is her prize package! and put February Contest in the subject line.